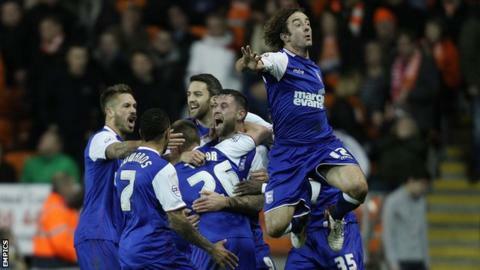 Ipswich Town midfielder Stephen Hunt has said he was hurt by Blackpool's claims that he wanted too much money. Hunt made his two weeks ago and seemed to celebrate Daryl Murphy's late winner with extra delight. "I've never had a bigger insult in my life than for somebody to call me greedy," he told BBC Radio Suffolk. "It hurt and it was remembered. That's obviously come out in the goal celebration. "I've already apologised to Murphs for not celebrating with him. I had my own separate agenda. "Things over the summer were fresh in my mind and I got carried away a bit." He had been in discussions over joining Blackpool, but after the deal fell through Ince said: "Myself and the chairman [Karl Oyston] said we weren't prepared to pay that amount of money for someone who's been injured for quite a while and was coming here to show me his fitness." Hunt, who has played 382 league games for sides including Reading, Hull and Brentford, said he was surprised by Ince's claim. "Paul Ince said to me his hands were tied and he couldn't do anything. He said 'now you know where I stand regarding the chairman'," Hunt said. "So when he called me greedy three or four days later I was a little bit surprised. "I can understand him backing his chairman, because they have to stick together as a team. But at the same time I didn't need him calling me greedy because that's one thing I'm not. "I turned down a deal in France and probably made a mistake in turning them down. I didn't make a mistake walking away from Blackpool because I have my pride and my dignity in tact."